Are you ready for a safari?! Today we take a trip to South Africa with CZT Milde Weiss to explore her easy safari-inspired Loxo tangle. Loxo is interesting for its inspiration, shown here, and also because a graphite-filled tortillion is used to add detail. Failing a grungy tortillion, a very light touch with a pencil followed up by smoothing with a tortillion will do the job. (My example is a combination of both.) Can you guess what this is? “We have been visiting the Kruger National Park for the past 3 weeks and had some wonderful game sightings. 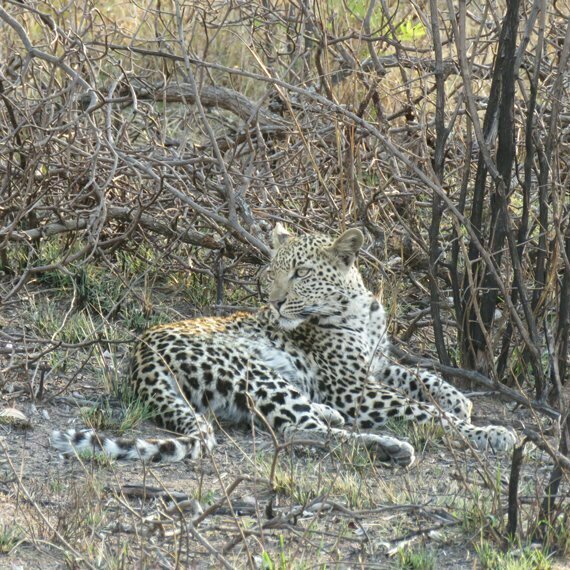 Milde also sent along this fabulous photo with the note “I just can’t resist the temptation to attach one of the pictures I snapped in the Kruger National Park – for your enjoyment!” I’m sure she won’t mind me sharing it with you too. And now for Loxo. Milde’s first Zentangle® tile includes the Zentangle-originals Pokeleaf and Pokeroot. Of her second tile she writes, “In the sepia variation I alternated lines with solid parts and used a white Gellyroll 10 (I love that pen!) 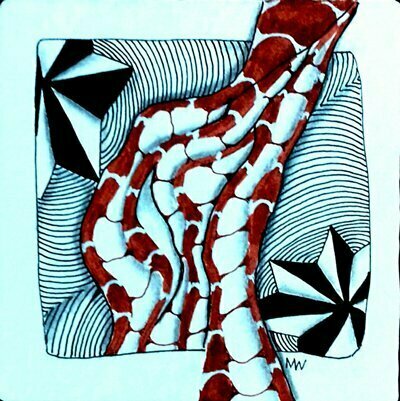 to add the curved lines.” This tile includes the Zentangle-original Gneiss and lots of radiating auras. Milde illustrates the step-by-step instructions for drawing Loxo below. “Start by drawing irregular vertical lines, which are then intersected by curved lines, alternating the upwards and downwards curves. 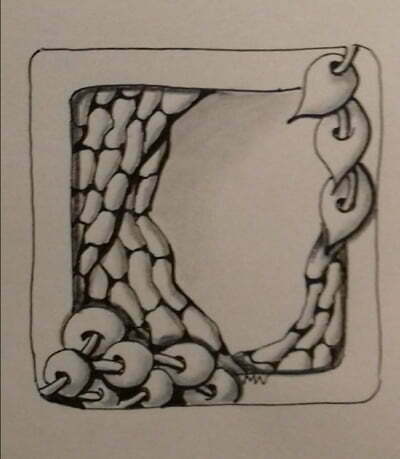 Round the corners and shade.” The tangle enhancer called Rounding and the graphite curves finishing the sections off really make this tangle. Your use of a tortillon as a “pen” is so innovative. 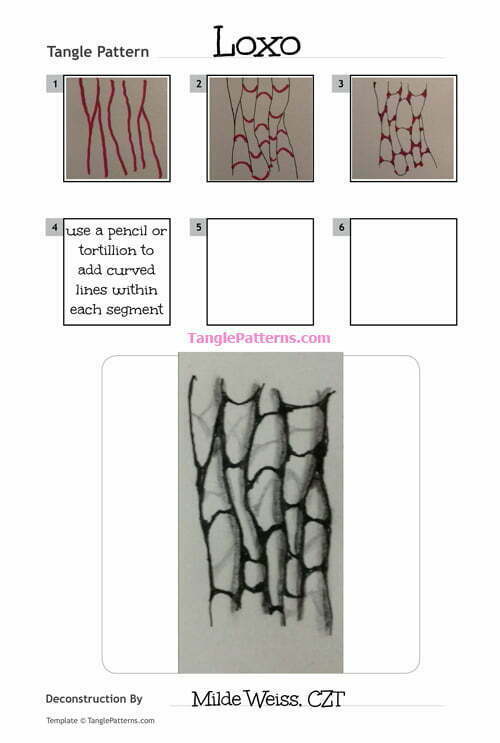 I see many applications of this technique to other tangles as well. Love the rustic, organic feel to this tangle. Definitely will be using this tangle. I visited Kruger National Park back in the 90’s and have many fond memories of the short safari I was on. Hope you had a wonderful time! Love the organic flow to this and will definitely give it a try. Your examples are terrific. Must have been an exciting trip. I find this tangle very appealing and most satisfying to use. I too, love the organic look to it, something different, thanks Milde. Thanks for all the positive feedback, y’all. As the Kruger Park is far from where we live (1600km or 994 miles), we don’t go there very often. So this was a very special visit! I find that many of my tangle inspirations come from nature, and we are very fortunate to be within reach of seven of our smaller National Parks. Some of them even have big cats as well, Sharon! 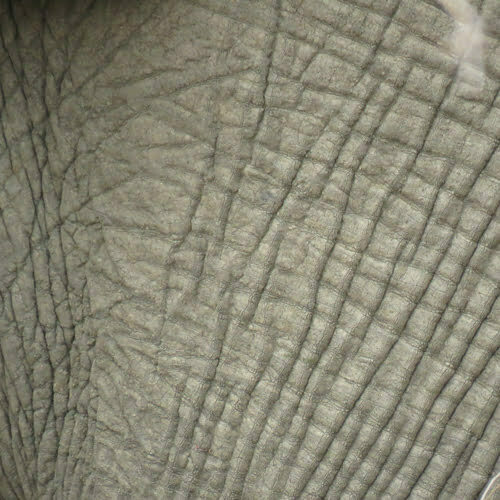 I can feel the elephant hide inspiration! Thank you Milde for a unique and interesting new tangle!